Through the use of technology, we are able to provide a full suite of high-end customised wealth advisory service at approximately 1/4 the cost of traditional unit trusts (mutual funds) or human financial advisors. 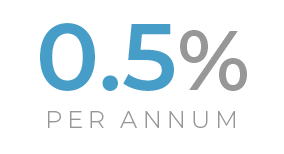 Moreover, we have absolutely zero hidden fees that erode your investment returns. 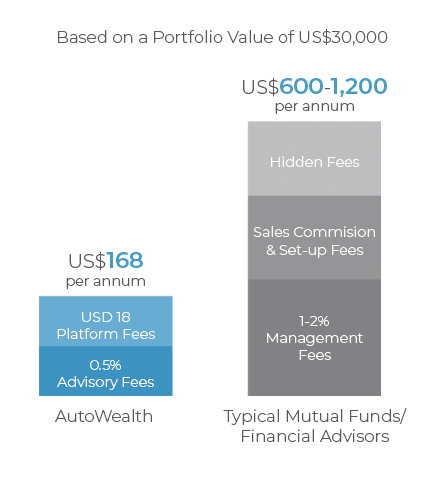 The platform fee covers all custody fees & transaction fees resulting from managing your investments. Enjoy infinite number of deposits, withdrawal and rebalancing without paying a single cent more. AutoWealth uses technology to augment many of our processes such as investment portfolio construction, monitoring, managing and reporting. Through this innovation, AutoWealth is able to provide high level of service without having to incur huge expenses from hiring teams of sales people and relationship managers. Staying true to our social cause of helping everyone and anyone grow their wealth, AutoWealth only charges enough to cover our operational costs and generate a modest profit. This translate to way lower management fees, and consequently, our clients take home a way higher proportion of their investment returns!